How long will the bearing last as compared to time it has been in operation already? When did the first defect appear? What is the source of damage? Is it change in bearing clearance, lack of lubrication or excessive vibration that causes the damage? The diagnostic system will provide the answers to these questions and many others. vibration of the rolling elements. 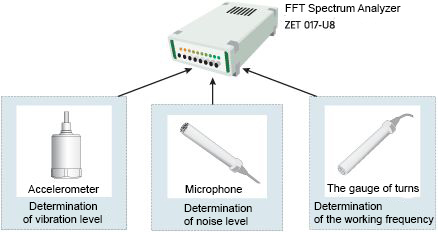 Spectral analysis takes place in real-time, spectrum of the vibration sensor signal is shown on the monitor screen, all spectral components of the harmonics are distinguished by different colors. All parameters are continuously monitored, measured and compared with normalized data. Operator is given a corresponding message in case they exceed the set standards of any parameter. The system allows bearings and nodes acceptance testing performing.